A book fair in a convention centre in Hong Kong’s Wanchai district. Some people here are perusing books on acrobatics. Others are here for contraband politics. 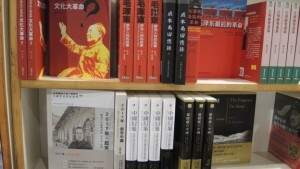 Ever since five booksellers disappeared last year, only to surface in detention in China, the spotlight has fallen on to Hong Kong’s many publishing houses that produce copious amounts of gossip about China’s political leaders as well as other works banned in the mainland. The theme for this year’s book fair was martial arts. 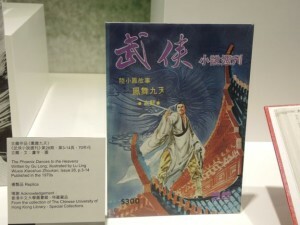 But this is Hong Kong, and politics was still on display, although publishers acknowledged that because of the bookseller controversy, there were fewer such books this year. One political book was so sensitive it had to be written in secret and smuggled out of China. And no Hong Kong publisher was willing to print the book – so it was eventually published in June by human rights organisations in Taiwan. 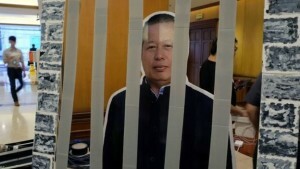 The book was by prominent Chinese dissident and rights lawyer Gao Zhisheng, and was titled: Stand Up China 2017 – China’s Hope: What I Learned During Five Years as a Political Prisoner. In it, Mr Gao describes how he was allegedly tortured by the Chinese government. He was released from prison in August 2014 but remains under virtual house arrest. Mr Gao’s is exactly the sort of book China doesn’t want appearing on the mainland. A human rights lawyer from Guangdong, Fu Ailing, told me she bought several books from a book store in Hong Kong, including Mr Gao’s. But they were confiscated by customs officials in Guangzhou on 21 July, who had detected the books when they x-rayed her backpack. Local authors aren’t afraid to be controversial either. A new book whose title translates as Hong Kong’s New Political Vocabulary is a “dictionary” featuring about 150 new Chinese words made up by the authors. The authors argue that recent social movements such as the pro-democracy Occupy Central protests have created a new, more defiant language in Hong Kong. Because Chinese characters are pictographs, the authors replaced the components of existing Chinese characters to give them complex new meanings. For example, one character they’ve created combines the word for “country” (国) with two iterations of the word for “system” (制) – in reference to the “One Country, Two Systems” agreement under which Hong Kong is governed. And their creativity seems to have paid off – this book was one of those that proved popular at the fair. Such overtly political books are a minority at the fair – and not everyone is a fan of them. One visitor to the fair, a Mr Wang from mainland China’s Sichuan province, said he was not there for the banned books. “Some contents in the banned books were fake,” he said, adding that only those based on history were worth reading. 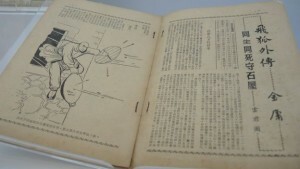 However, he did admit he had taken banned books back to mainland China for his friends in the past. For many, this fair was just about the literature of martial arts – and its a genre that unites Chinese readers of different political stripes. Sze Yan Ngai, the man who produced “Gulong Online”, Hong Kong’s first martial arts online game, told me that “martial arts literature is a common language for the Chinese speaking world”. He did not think the growing tension between China and Hong Kong or Taiwan would affect people’s love of the genre. Instead, he argued, the universal themes of martial arts appealed to everybody, because they depicted a world where justice and integrity could conquer evil. 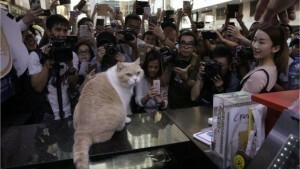 And, aside from martial arts, perhaps the standout star of the fair was “Brother Cream” – Hong Kong’s most famous cat. “Brother Cream”, who used to be based at a local convenience store, went missing in 2012. He made headlines after he was found safely 26 days later – and became a social media celebrity. Now he has over 43,800 followers on Instagram and his own PR manager – so perhaps it’s not surprising that one of the most popular books on sale was his biography. Hundreds of fans lined up to take photos with him – because it was his first appearance after retiring from being a “shop manager” at his local convenience store this year. This entry was posted in Headlines, Press Freedom, Publications and tagged Gao Zhisheng, martial arts， book fair ，Hong Kong. Bookmark the permalink.